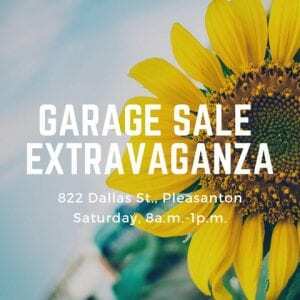 Check out this week’s Pleasanton Express Garage Sale Extravaganza! Saturday, Feb. 8 beginning at 8 a.m. to 1 p.m.
Be a part of the Pleasanton Express GSE by paying an additional $2 when you place your garage, yard, rummage, moving sale with our Classifieds Ads Manager, Loni Just. By being a part of GSE, you get the opportunity to join other garage sales in the area in being promoted on all Pleasanton Express social media outlets (Facebook, Instagram, Twitter and our website) like the one above! Give us a call today at 830-569-6130 and ask for Loni Just!